Wartortle in game: 410 Who? Important notice! Pokemon Wartortle is a fictional character of humans. Wartortle (Japanese: ??—? Kameil) is a Water-type Pokémon introduced in Generation I.
Wartortle is a bipedal, indigo-blue Pokémon similar to a turtle. It has brown eyes, a dark blue streak on each cheek, and two sharp teeth protruding from its upper jaw. It has three clawed fingers and pointed toes. Bluish white fur covers its long ears and tail. A brown shell with a pale yellow underside encases its body. A thick, white rim separates the upper and lower halves of the shell. 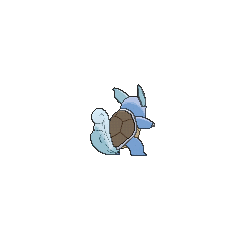 As Wartortle grows old, its tail fur will darken, and it may have algae growing on its shell. The shell may also carry scars from past battles. 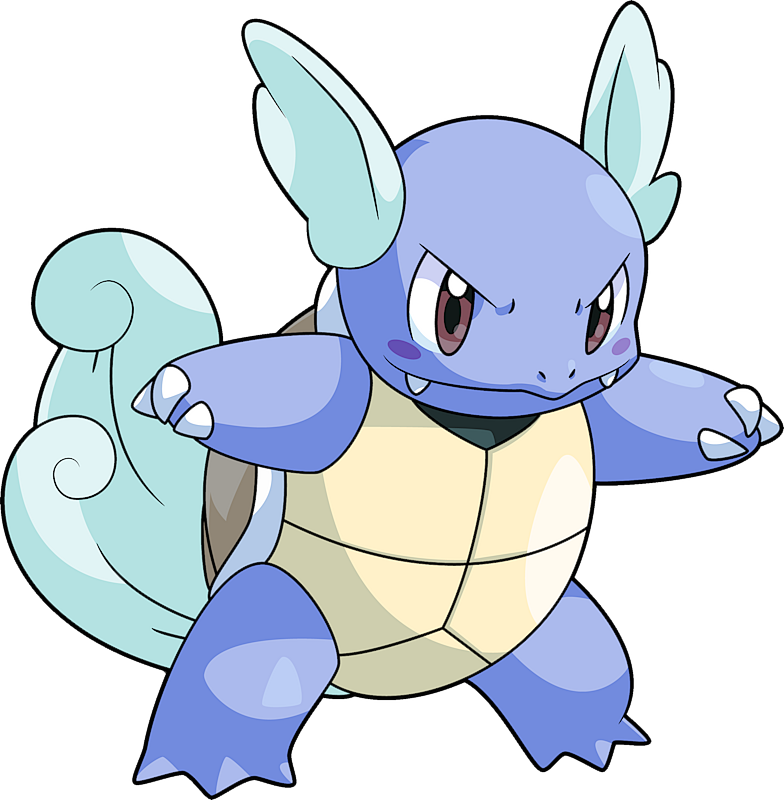 To maintain balance while swimming at high speeds, Wartortle moves its furry ears and tail. It can use the fur to store air for extended underwater diving. Its tail is a popular symbol of longevity, making it popular with the elderly. It hides in water when hunting and emerges to surprise its prey. In the past, Skull Bash was its signature move. The anime has shown that Wartortle can be found living in colonies on islands, but its preferred habitat seems to be freshwater ponds and lakes. A group of Wartortle is part of a fire-fighting squad. Team Wartortle work alongside Team Squirtle and Team Blastoise depending on which evolutionary form is best for the situation. Ash's Squirtle joined Team Wartortle to prove its strength in The Pokémon Water War. Team Wartortle later went up against the Squirtle Squad — this time with the opponents being led by Ash's Squirtle — in a fire-fighting competition in The Fire-ring Squad. May's Squirtle was revealed to have evolved into a Wartortle in Staging a Heroes' Welcome!, in which it was used in the Performance Stage of the Wallace Cup. Tierno's Wartortle appeared in Good Friends, Great Training! after having evolved from Squirtle. He has since evolved into Blastoise. 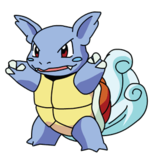 Wartortle's debut appearance was in Beach Blank-Out Blastoise where a group of Wartortle and Squirtle were troubled by their leader, a Blastoise, not waking up. A Wartortle was owned by a teenager named Jimmy in Judgment Day. The Wartortle evolved into a Blastoise to free itself and Jimmy's Ivysaur and Charmeleon from Team Rocket. A Wartortle was among the Pokémon controlled by Cassidy and Butch in Pikachu Re-Volts. Two Wartortle were part of an exhibition in Flower Power. 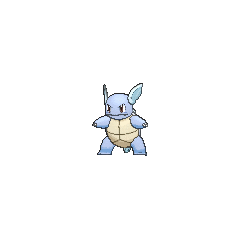 A Wartortle also appeared in Pokémon Double Trouble and Dueling Heroes. A Trainer used a Wartortle in Hook, Line, and Stinker to aid him in the annual Seaking Catching Competition. A Wartortle was one of the Pokémon belonging to a crew that appeared in Jenaro's story in Hi Ho Silver... Away!. An image of a Wartortle appeared in Hocus Pokémon. A Wartortle was used by a competitor in the Tour de Alto Mare, a water chariot race, in Pokémon Heroes: Latios & Latias. A Wartortle was used by one of the students of the Pokémon Trainer's School in Gonna Rule The School!. Blue was about to send out Wartortle in File 2: Cubone but the screen shifted to the Pokémon House instead. Wartortle evolved into Blastoise sometime before Red fought Blue in the Pokémon League in File 4: Charizard. Green had a Wartortle named Blasty during her first appearance in Wartortle Wars, which evolved from the Squirtle that she stole from Professor Oak. It has since evolved into Blastoise very quickly, and became a mainstay in her team ever since. 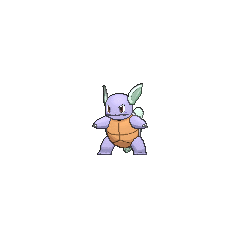 Even though Wartortle's ears are depicted lighter than its face in the official Sugimori stock art and most of its game sprites, the official promotional pictures usually have the ears the same color as its face. Its design appears to be a stylized turtle. Its feathery tail is a reference to Japanese legends of the minogame (?? ), a turtle which lived for 10,000 years and grew a tail made of seaweed. The use of its tail to store oxygen seems to be a reference to certain turtles that breathe through their cloaca, placed near the tail. Wartortle's name is a combination of war or warrior, tortoise, and turtle. Kameil comes from the Japanese word ? kame (tortoise/turtle) and may be a combination of ? kame and ?—? tail. It is also a corruption of ??? kameru (to be able to bite).